Love your neighbor as yourself.” Matthew 22:36-40. Except for someone that have the mind of Christ, you might struggle with this topic. However, my intention is not to force anyone but to Convey God’s mind. I have seen many people cursed and withheld their gifts, but later ask for God’s forgiveness when they hit the rock. Though we genuinelyt need money to propagate the work of Christ, however, in Healing Hour Ministry it is not a priority. For example, when the Lord first gave me the revelation of Bishop David Oyedepo, derailing pastor Enoch Adejare Adeboye from the kingdom track; It took a lot of Prayer, boldness, and courage for me then to reveal it to my pastor and one assistant general overseer. I am sure it will not take so much from me anymore to do the same now. That is one of the benefits of separation that I learned. 1. Because many people have turned pastor Adeboye to god, and himself has cunningly accepted the status with false humility. 2. Because I know they will tag me or anyone that dare to say anything about Adeboye or Oyedepo as Beelzebub. 3. Because I know that as usual RCCG will set other members against you and set up prayer warriors to start ”holy ghost” prayer to kill you or whoever for revealing the mind of God to a man. IT IS BETTER TO REMAIN AN IDOL WORSHIPPER THAN TO JOIN THE REDEEMED CHRISTIAN CHURCH OF GOD. ”Love the Lord your God with all your heart and with all your soul and with all your mind. This is the first and greatest commandment. And the second is like it: Love your neighbor as yourself.” Matthew 22:36-40. Jesus himself showed His love for people by crossing lines of what is socially and culturaly acceptable to do. Everyone including born again Christians is part of a culture. We learn what is considered culturally right and acceptable. We learn to behave to be considered good members of our society, even if it means saying things, doing things or not saying or doing them despite the fact it is not what we ourselves believe. Jesus showed us that we should do what is right in the eyes of God and love one another even when it is not socially or acceptable to do due to religious tradition. WHAT PASTOR ADEBOYE AND OYEDEPO HAS IS NOT CHRIST LOVE, BUT THE LOVE OF MONEY. How can you believe God and acted upon His instructions, when you receive glory from one another and do not seek the glory that comes from above? Brethren, if every prophet or messenger were or afraid of what would men say, and hide what God is saying, the children of God may not have a clue that they have gone astray. Dare Christians, wake up the men of gods have sold you for a pot of porridge, dare to set yourself free. DID GOD NOT COMMANDED DOMINION TO HIS CHILDREN? “And He went up on the mountain and called to Him those He Himself wanted. And they came to Him. Then He appointed twelve, that they might be with Him and that He might send them out to preach, and to have the power to heal sicknesses and to cast out demons:” Mark 3:13-15 NKJV. Are You A Believer In Christ? You’re part of the calling. If you hang around the worldly people to interpret the benefits of being born again, you will keep on confusing yourself with fallacies, And the medical doctors in conjunction with ”miracle healer” will continue laughing to the banks because of your ignorance. Jesus say, “But seek first the kingdom of God and His righteousness, and all these things shall be added to you.” Matthew 6:33 NKJV. Your divine healing also is in the package of your salvation dare to unwrap and utilize it as needed. BISHOP AND A DAY OLD BELIEVER’S IN CHRIST HAVE THE SAME AUTHORITY IN CHRIST. Except the ones that are ignorant of what they carry or maybe they have traded it for a pot of Poridge in a “Redemption” camp. “The Spirit of the LORD is upon Me, Because He has anointed Me To preach the gospel to the poor; He has sent Me to heal the brokenhearted, To proclaim liberty to the captives And recovery of sight to the blind, To set at liberty those who are oppressed; To proclaim the acceptable year of the LORD.” Then He closed the book, and gave it back to the attendant and sat down. And the eyes of all who were in the synagogue were fixed on Him.” Luke 4:18-20 NKJV. “So Jesus said to them again, “Peace to you! As the Father has sent Me, I also send you.” And when He had said this, He breathed on them, and said to them, “Receive the Holy Spirit.” John 20:21-22 NKJV. Christians Dare to use your Authority in Christ. Beware Of Sowing Your “Isaac” As Seed Towards Any Bishop’s Private Jet. False hope is when someone tells you that “if you give your “Isaac” to daddy G.O, Bishop or a Pastor you will be issued a visa to travel out of your country. Brethren, even if you give all your children one after the other, not to talk of “Isaac” you will still pass through a process before you receive a traveling visa. The embassies are not dumb as you are, they will still question your purpose of traveling and means to travel with before they issue you a visa, therefore get your act and facts right beyond giving any “Isaac”. Abram’s Isaac means obedience to God’s instruction, not to a Daddy G.O or Bishop COVETOUSNESS. WE WILL ALL PASS THROUGH SOME THINGS, SOMEHOW And no amount of seeds we sow can exempt us from God’s waiting period. As born again Christians we should also put the FEAR OF GOD in consideration always in all our religiosity. Whether you gave your “Isaac or Joseph” to a daddy g.o you still have to put the appointed time into consideration. As at this morning many BORN AGAIN CHRISTIANS are in the foreign countries with fake documents that they sowed their “Isaac” to acquired and many are facing the consequences of their stupidity alone without no Daddy G.O or Bishop in view. Been a follower of Christ doesn’t mean that you will become instant millionaires without anything to show forth, or that you are not going to pass through a few things before you arrived at your destination. As a matter of truth If you want to hold on to God’s standards in this dying world, you don’t have another choice than to wait on God’s faithfulness and that is by FAITH. Our General Overseer and Bishops are the ones giving many children of God false hope and testimonies that are pushing many people towards anxiety, covetousness and at the end of the day, many are confused and depressed because they have sown everything they have by order of Daddy G.O or Bishops, but it seems that God is tarrying. God is not lingering; it is many of the Bishops that are giving us false hope. There is always a time for waiting. FAITH! WAIT FOR YOUR APPOINTED TIME IN YOUR HOME LAND, SO THAT YOU WILL NOT BECOME A HOPELESS WAITER IN FOREIGN LAND. 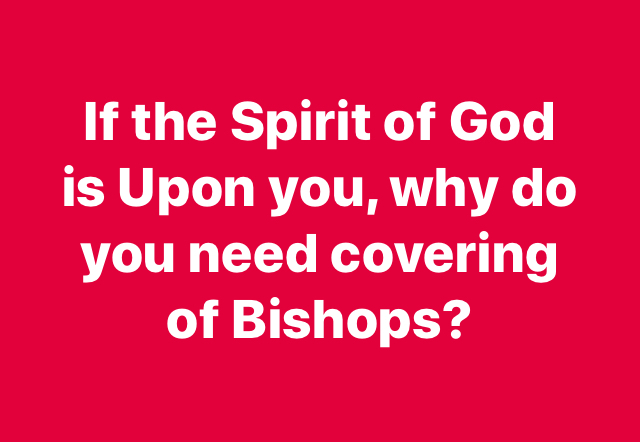 Knowing Jesus, Christ, and the Holy Ghost Characteristics Will Save Christians From Bishops or General Overseer’s Fallacies and Fraudulent Acts. “He who receives you receives Me, and he who receives Me receives Him who sent Me. He who receives a prophet in the name of a prophet shall receive a prophet’s reward. And he who receives a righteous man in the name of a righteous man shall receive a righteous man’s reward.” Matthew 10:40-41 NKJV. HOW WOULD YOU KNOW IF THEY ARE NOT BUSINESSMEN? “For they bind heavy burdens, hard to bear, and lay them on men’s shoulders; but they themselves will not move them with one of their fingers. Matthew 23:4. Jesus Christ never asked anyone throughout His ministry, and He will never ask anyone now to ask His followers for one billion naira offerings for whatever reason. Jesus Christ never asked anyone of His followers to sell their inheritance and bring the proceeds to Jesus camp for divine prosperity, or a hundredfold return, and He will never ask anyone to do so in any Redemption or Shiloh camp. Jesus Christ never asked any of His followers to buy silver, gold, or platinum tree to be planting and nurturing in any redemption camp, and He will never suggest that to any governing body to do so for kingdom purpose. “Jesus said to him, “If you want to be perfect, go, sell what you have and give to the poor, and you will have treasure in heaven; and come, follow Me.” Matthew 19:21 NKJV. Brethren, You are free to use your discretion; men of God are not the final authority in the Christ Kingdom, the Holy Ghost is. Moreover, as believers in Christ, you need to take some time to study more about the characteristic of Jesus Christ with the help of the Holy Spirit and not in open heaven, mountain experience or excellency of wisdom of any man.